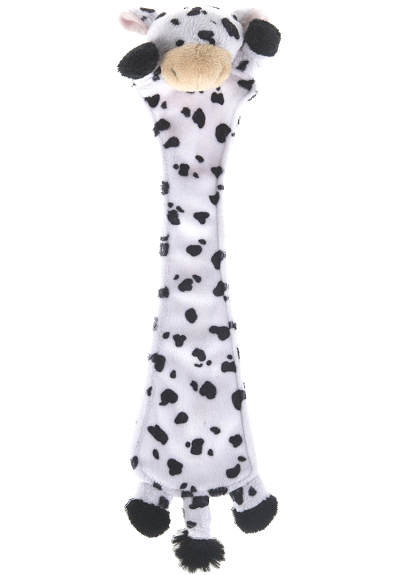 This adorable little cow Farm Page Pal plush bookmark is great for making reading fun! With a soft white body with black spots, light pink inner ears, white felt horns, and embroidered eyes and details on a sweet face, this fun cow stuffed animal bookmark is the perfect book companion. Simply insert the body into your book with the head sticking out and this cow plush bookmark will save your place for you. Plush bookmarks are not only wonderful for stocking stuffers, Easter baskets, and giveaways, but are great as reading rewards and everyday "just because" gifts as well. 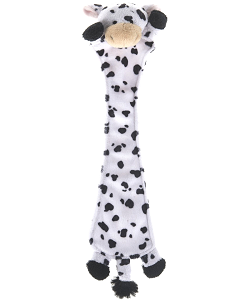 Note: This cow Page Pals plush bookmark can be personalized at your local embroidery shop. This adorable little pig Page Pal plush bookmark has a soft light pink body, beige accents, cute rolled-over ears, and a sweet face. Milkshake is a huggable plush cow with a huggable chunky body of soft white and black fur and fun oversized feet. This adorable little cow plush keychain has soft black-spotted white fur, pink accents, and a sweet, smiling face. This sweet little Handfuls stuffed cow has a big smile, soft white and black fur, and fun cream horns. This adorable fabric wall art cow is a wonderful addition any barnyard, farm scene, or outdoor theme. In My Farm Adventure, your child plays detective and helps Harriet Holstein and the other farm animals find Rooster.